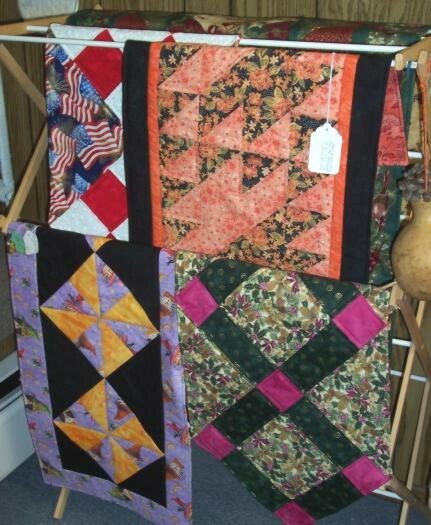 All of the quilts on this page were sewn and quilted by Diana Day, unless otherwise stated. Item NYBeauty. This New York Beauty quilt is paper pieced. It measures 62 x 62 inches, $372.00. Click here to view the New York Beauty quilt bigger in a new window. This Tree of Life quilt measures 47 x 69, $232. We still have panels available. Click here to view the Tree of Life quilt bigger in a new window. Here's another link, to a detail view. Item #6-1335. This is a One Block Wonder quilt, like the ones we make during my One Block Wonder classes. It measures 66 x 76 inches, $272.00. Click here to view item #6-1335 bigger in a new window. Item #6-1334. Susie's Zoo measures 46 x 55 inches, $152.00. Click here to view Susie's Zoo bigger in a new window. This Number Book panel quilt has flannel on the back. It measures 46 x 56, $152.00. Click here to view item #6-1333 bigger in a new window. Item #6-1332. 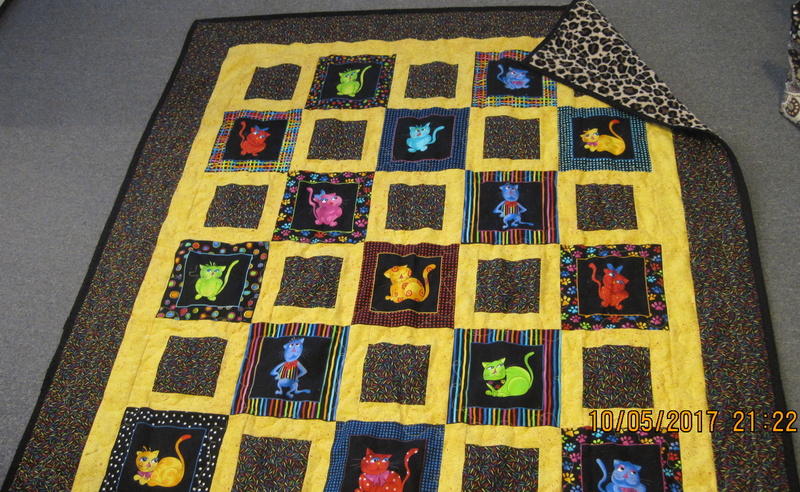 Here's a Happy Cat quilt with cuddle fabric on the back, 50 x 56 inches, $162.00. Click here to view item #6-1332 bigger in a new window. Item #6-1331. This Stack and Whack quilt measures 54 x 54 inches, $152.00. Click here to view item #6-1331 bigger in a new window. Item #6-1330. Here's a Happy Dog quilt, 48 x 55 inches, $152.00. Click here to view item #6-1330 bigger in a new window. Item #6-1329. 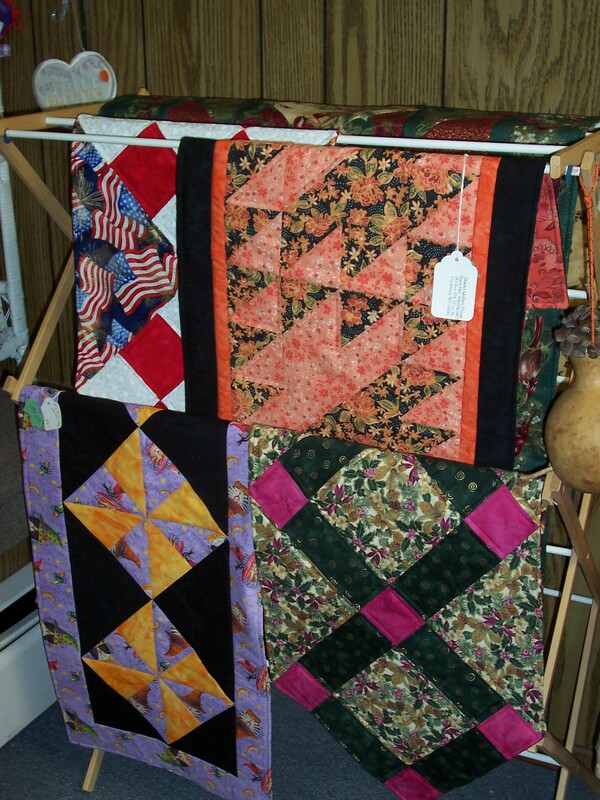 This Flag Quilt measures 38 x 58 inches, $109.00. Click here to view item #6-1329 bigger in a new window. Item #6-1327. This Chicken Quilt has cuddle suede on the back. It measures 52 & 1/2 x 68 inches, $252.00. Click here to view item #6-1327 bigger in a new window. Here's a link to another photo of item #6-1327 that shows the back.. Item #6-1326. This quilt is paper pieced. It measures 72 x 83 inches, $402.00. Click here to view item #6-1326 bigger in a new window. Item #6-1319. This decorative Harvest panel quilted lap throw has a hanging sleeve on the back. It measures 34 & 1/4 x 52 inches, $109.00. Item #6-1317. This Square Piece quilt is made from a Hoffman kit available at my store. It measures 78 x 78 inches, $292.00. Click here to view item #6-1317 bigger in a new window. Here's a link to a close up photo of item #6-1317 that shows the back.. Item #6-1316. This Garden Tea Party quilt uses a Lorali panel. It measures 56 x 78 inches, $272.00. Click here to view item #6-1316 bigger in a new window. Here's a link to another photo of item #6-1316.. Item #6-1315. This Thicket quilt was made using a kit. It measures 56 x 64 inches, $219.00. I have these kits for sale. Click here to view item #6-1315 bigger in a new window. Item #6-1314. This Seamstress quilt uses a panel. It measures 40 x 58, $152.00. I have these kits for sale. Click here to view item #6-1314 bigger in a new window. Item #6-1313. 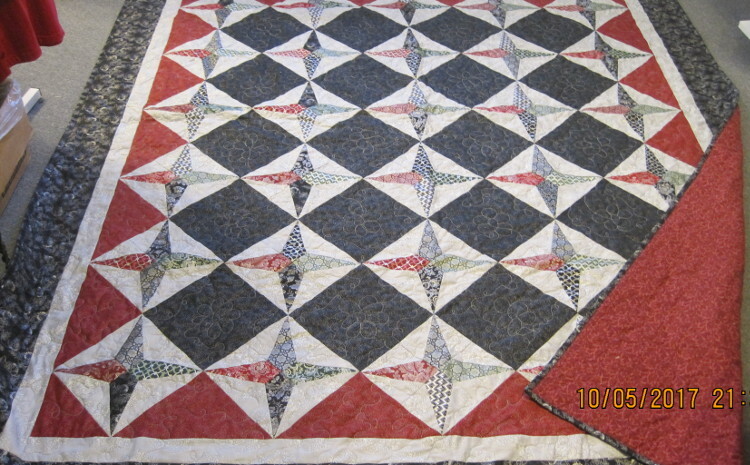 This Hunters star quilt was made using the hunters star die from AccuQuilt. It measures 60 & 1/2 x 73 inches, $372.00. Click here to view item #6-1313 bigger in a new window. Item #6-1311. The Sewing Machines quilt has cuddle on the back. It measures 42 x 62 inches, $252.00. Click here to view item #6-1311 bigger in a new window. Item #6-1309. 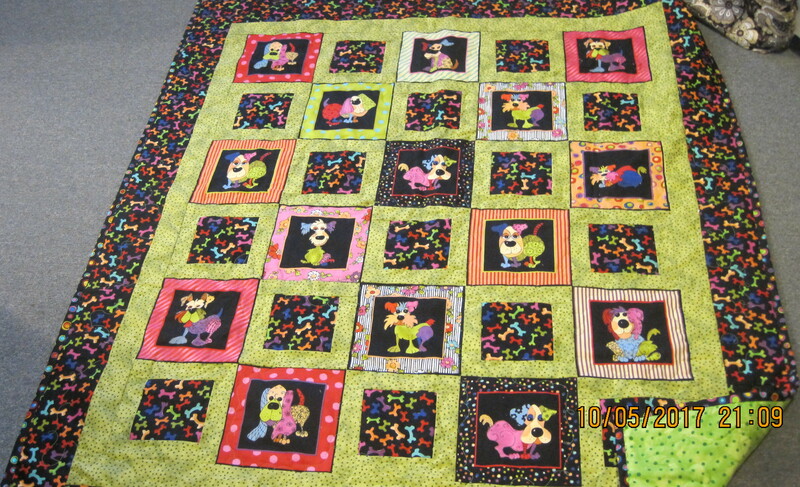 This is a One Block Wonder quilt, like the ones we make during my One Block Wonder classes. It measures 64 x 72 inches, $372.00. Click here to view item #6-1309 bigger in a new window. Here's a link to another photo of item #6-1309 that shows the back - it's the same fabric whole that was pieced on the front. Item #6-1308. 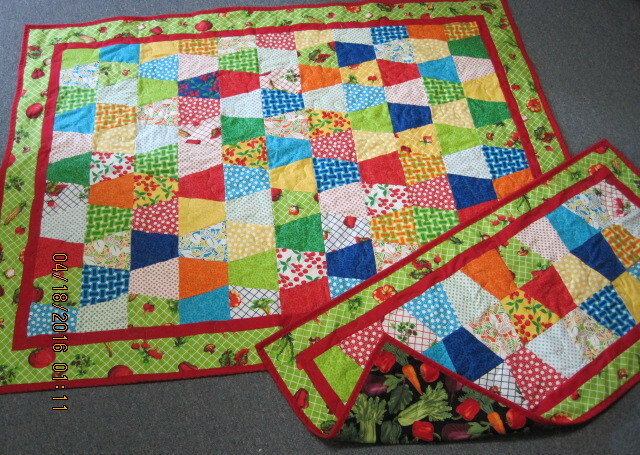 This quilt is made with a Loreli Christmas fairies panel. It measures 57 x 74 inches, $372.00. Click here to view item #6-1308 bigger in a new window. Here's a link to another photo of item #6-1308 that shows the back.. Item #6-1307. This Hunters Star quilt was cut using the Hunters Star Die from AccuQuilt. It measures 59 x 59 inches, $252.00. Click here to view item #6-1307 bigger in a new window. Item #6-1305. This cat panel quilt has cuddle fabric on the back. It measures 52 x 58 inches, $252.00. Click here to view item #6-1305 bigger in a new window. Item #6-1304. This Maple Island panel quilt has cuddle suede on the back. It measures 52 x 58 inches, $292.00. Click here to view item #6-1304 bigger in a new window. Item #6-1303. 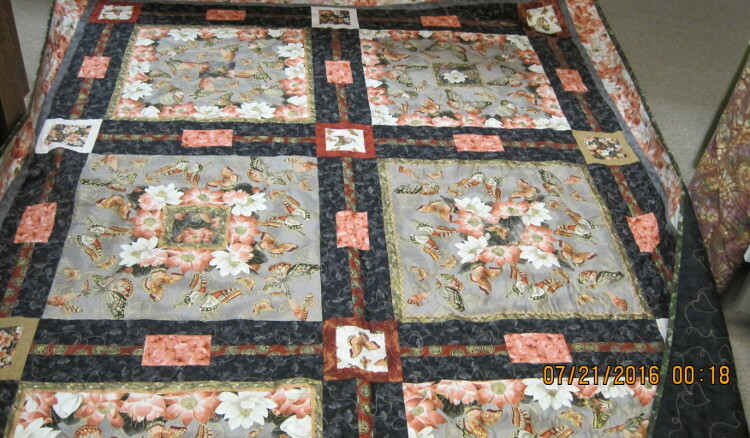 This quilt is a combination of wildlife panels with Log Cabin pieced blocks. It has green cuddle suede on the back. It measures 55 x 75 inches, $372.00. Click here to view item #6-1303 bigger in a new window. Item #6-1302. This Snowmen quilt has cuddle on the back. It measures 51 x 51 inches, $109.00. Click here to view item #6-1302 bigger in a new window. Item #6-1300. I have kits that include both this Joy to the World and Rejoice panels (#6-1321, not shown). 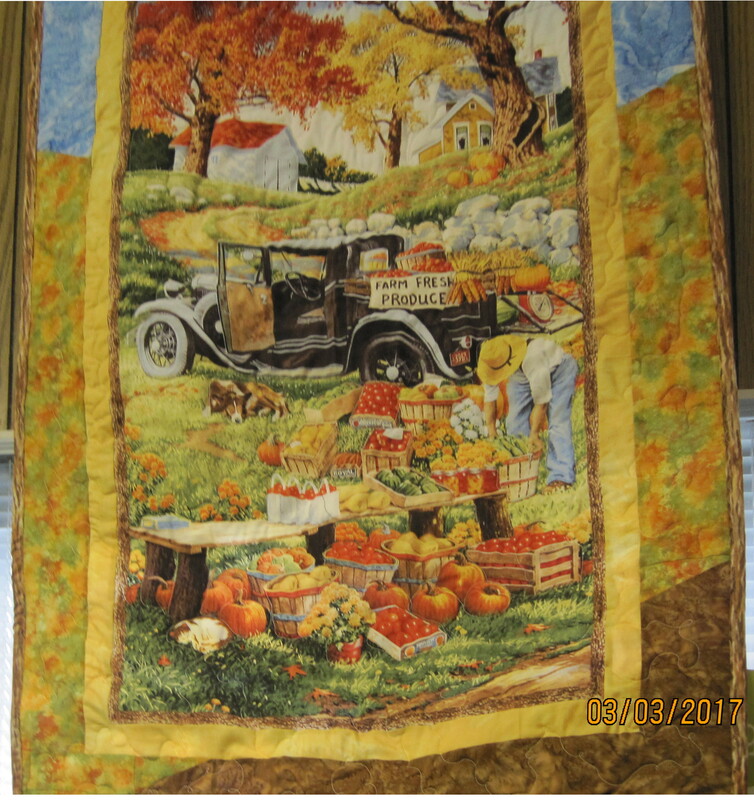 These quilted hangings are each 36 x 40 inches, $90.00. Item #6-1299. This wildlife panel quilt has brown cuddle suede on the back. It measures 54 x 69 inches, $329.00. Click here to view item #6-1299 bigger in a new window. Here's a link to another photo of item #6-1299 that shows the border and back.. Item #6-1297. This Susie's Zoo quilt has cuddle on the back. It measures 44 x 53 inches, $109.00. Click here to view item #6-1297 bigger in a new window. Item #6-1296. This Kid's quilt has cuddle on the back. It measures 45 x 54 inches, $109.00. Click here to view item #6-1296 bigger in a new window. Item #6-1295. This Flowers and Butterflies quilt was made using Kona Bay fabrics. It measures 72 x 100 inches, $372.00. Click here to view item #6-1295 bigger in a new window. Item #6-1293. This kids quilt has cuddle on the back. It measures 46 x 54 & 1/2 inches, $109.00. Click here to view item #6-1293 bigger in a new window. Item #6-1286. Here's a table cloth and table runner, done with the AccuQuilt tumbler block. Table cloth is 40 x 52, table runner 18 x 38, $85.00 for the set. Item #6-1284. This quilt is "All Bundled Up". It measures 59 x 68 inches, $252.00. I have these kits for sale ($87), kit does not include backing or batting. Here's a link to another photo of item #6-1284.. Item #6-1281. This oval Christmas Poinsettias Table Runner measures 54 x 74 inches, $152.00. Click here to view item #6-1281 bigger in a new window. 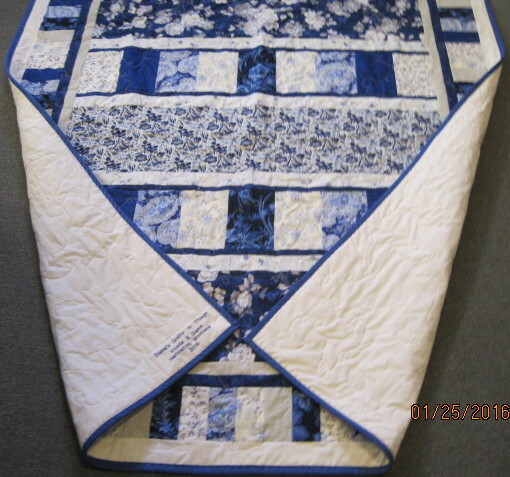 Here's a link to another photo of the blue and cream Bars Quilt, showing the back. Item #6-1274. This dinosaur quilt measures 76 x 94 inches, $342.00. Here's a link to another photo of item #6-1274 that shows the back.. Item #6-1271. This geometric quilt measures 104 x 105 & 1/2 inches, $542.00. Click here to view item #6-1271 bigger in a new window. Here's a link to another photo of the quilt, showing the back. Item #6-1266. This unusual quilt featuring hexagons was made using the AccuQuilt hexagon and equilatral Triangle dies. 72 x 87 inches, $352.00. Item #6-1264. 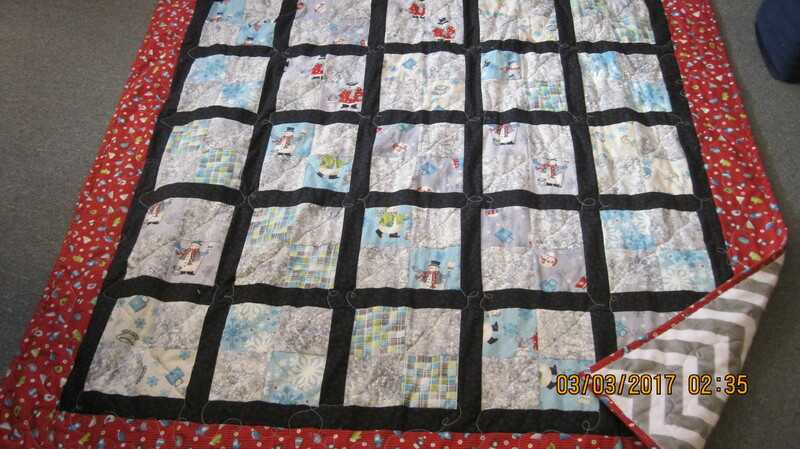 This Holiday Holly quilt measures 48 x 64 inches, $92.00. Click here to view item #6-1264 bigger in a new window. Item #6-1263. The center panel of this quilt with a basket of poinsettias is hand appliqued. It measures 68 x 68 inches, $312.00. Click here to view item #6-1263 bigger in a new window. Item #6-1258. I call this quilt Freedom to Fly. It measures 70 x 70 inches, $252.00. Click here to view Freedom to Fly bigger in a new window. Here's a link to a detail photo of the blocks.. Item #6-1234. Log Cabin Panel Quilt - Christmas Chickadees: this quilt was made from two floral panel fabrics that I have for sale in the store, centered in a log cabin block. It measures 49 x 66 inches, $154.00. Here's a link to another photo of the Chickadees Quilt, showing the back. Item #6-1211. A postcard pattern is a pattern the size of a postcard, that uses a charm pack as material. It measures 45 x 36 inches, $67.00. Click here to view item #6-1211 bigger in a new window. Here's a link to another photo of item #6-1211 that shows the back.. Item #6-1204. Here is a Disappearing Nine Patch quilt, like the ones we make during my Disappearing Nine Patch classes. 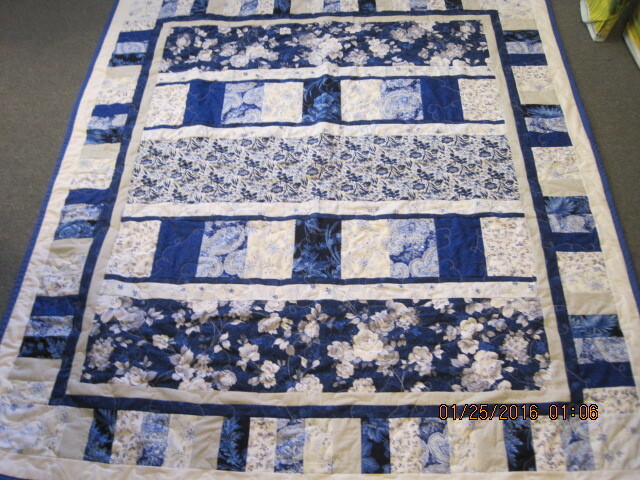 This quilt measures 71 x 85 inches, $272.00. Click here to view item #6-1204 bigger in a new window. Here's a link to another photo of item #6-1204. Item #6-1186. This Mariners Compass quilt was designed and sewn by me, and quilted by Laura Finkbeiner of Grass Range. It is queen size, 86 x 86 inches, $749.00. Click here to view item #6-1186 bigger in a new window. Here's another link, to a photo of item #6-1186's back, where the stitching details show. Here's a link to another photo of item #6-1186. Item #6-1147. This Bargello quilt measures 96 x 98 inches, $799.00. Here's a link to another photo of item #6-1147, showing the back. Click here for a third view. A rack of table runners (all table runners are reversible): #6-865 Fourth of July, backed with Fall $33.00. #6-695 orange & black, $28.00. #6-915 Pinwheel Halloween, Fall on the back, $33.00. (This pair is my creation, my pattern is sold in the store.) #6-837 Christmas runner, $31.00. I do make special order table runners and place mats. Here's the link to the big photo of the table runners. Table runners range in size, average size is 15 x 32 to 36 inches. I can make any size. I also have smaller ones and some octagonal shape ones. Placemats are usually 11 1/2 x 17 1/2 and usually sell for $8.50 each. All placemats are also reversible. Matching napkins are $4.50 each. I make 12 napkins for each set of 6 placemats - 6 napkins to match each side. Most of these items are unique and cannot be completely duplicated. If you want to build a quilt similar to one of these, I can help you choose a pattern and materials to order. More quilts are coming, check back in.